I heard from a reader last week -- let's make that, a listener -- who said, "Recently, I listened to your book which I downloaded from the National Library Service for the Blind." While I couldn't find it during a quick search of the NLSB site, I suppose those readers with visual impairments will be more familiar with the process. I am pleased, of course. 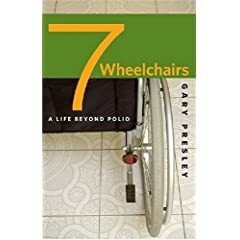 Seven Wheelchairs was published through The University of Iowa Press which did not have the resources to make it immediately available as an audio book. I do hear some word that the Press may issue a Kindle version soon. Terrific, Gary! Lots of readers--that is, listeners--out there to hear your book. Hi, Gary. This is good news. I will let some friends of mine know.